I stopped using national flower services years ago, mainly after reading some of the articles on FloristDetective.com — like this one, but really, just click all the links in the left nav that catch your eye. You’ll never order flowers from a middleman again. So, over the years, as friends have lost loved ones, or celebrated weddings and new arrivals, I always look for a local florist in the delivery area and call the shop direct to place an order. I’ve ordered directly from probably 10-15 florists across the U.S., but never before has something like this come in the mail after one of my orders. 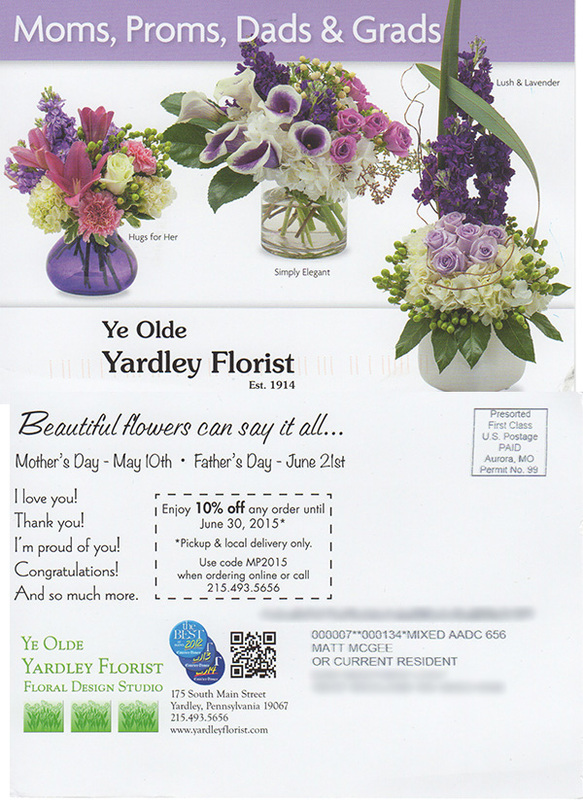 That’s the florist I used a couple months ago to send my mom birthday flowers a couple weeks after my dad died. She was hospitalized at the time, so there are other florists closer to her home that I’ll be using for Mother’s Day flowers next weekend. But still, what a nice touch to follow up with a postcard and a 10 percent discount. If they were closer to my mom’s home, I’d be calling them again this week. And I can’t help but wonder … why didn’t those other 10-15 florists ever follow up my long distance order with marketing/promotion like this? So simple, but I bet so effective.